We love how these beautiful Navette Crystals look like petals and leaves when clustered together. 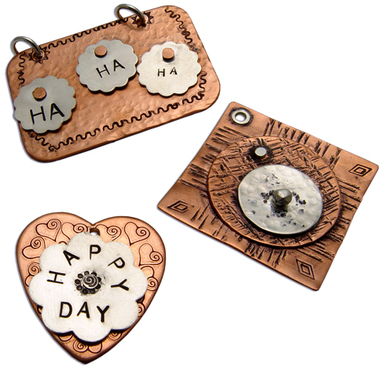 This project is an easy way to create a colorful garden of flowers in your jewelry. Whether you use large blanks for your base, ornamental heart blanks, or small simple ones, the results are beautiful. All you need to connect these beauties together are rivets and hex nuts. Hooray for cold connections! 1/16" EZ-Rivet Piercing and Setting Tool - $45.00 - This tool works great to rivet a couple layers together, like the Navette leaves to the blanks. It can also punch holes for the hex bolts to pass through. Mini Silver Plated Hex Nuts, Washers & Bolts, 1/4", 10 sets - $13.03 - We used Hex bolts to connect our Navette petals together because there are so many layers that a conventional rivet will smash them. The Hex bolts secure the multiple layers while letting the flowers keep their shape. Mini Gold Plated Hex Nuts, Washers & Bolts, 1/4", 10 sets - $14.51 - We like to mix up the colors and metals to add dimension, use whatever metal you love. Assorted Brass Hollow 1/16" Rivets - $9.65 - This rivets work great to secure one or two layers together, like the green navettes to the base blank. 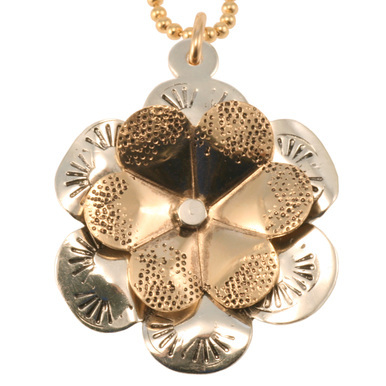 I clicked on the video for Swarovski Navette Flower Pendants and the video showing is for riveting. It shows the correct Tools and materials but the wrong video?